How to Cultivate a Good Living Habit? Living in a life with fast pace today, most people can’t attend to a good lifestyle. It is not because they don’t want to but due to lack of time. How to form a healthy living habit has become a tough question for modern people. But now, you just have to eliminate that concern. Fast pace life also brings rapid development of advanced technology. Why not let high TECH gadgets change your current situation? Therefore, what you should do now is to select a list of smart household appliances to make life easier and more comfortable. Don’t you feel energetic when you wake up with a fresh juice and bread every morning? A juice and food extractor or blender is such an easy way to help you do the trick. Built-in 2 speed modes and 3 position switch, the juice extractor is easy to control and operate. 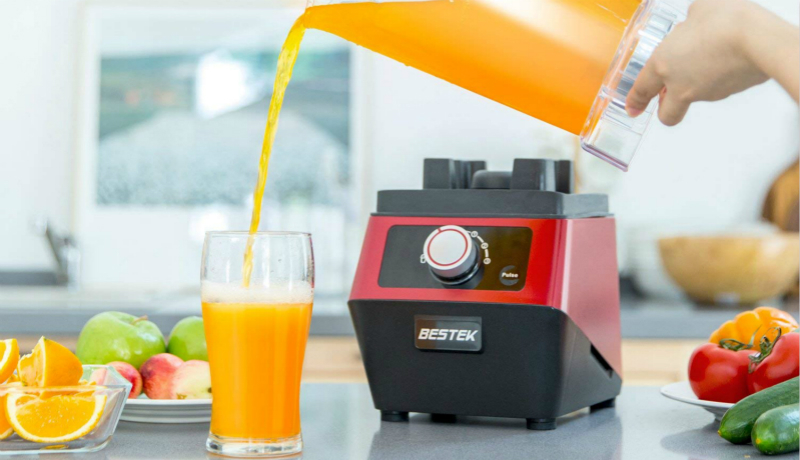 No matter you want to drink fruit or vegetables, the juice extractor can efficiently maximize the juice yield from soft, leafy greens and hard fruit. You can take in everyday necessary vitamins and minerals with this smart juice blender that can extract up food fast without compromising any healthy element. It is large enough to let you share healthy and delicious squeezed juice every day at home. Of course, a cup of thick compound of juice and vegetables is also a nice choice. 1000W high powered blender provides 20000 RPM fast speed to extract any soft or tough foods effortlessly and efficiently. Multi-functional blades can make fruit, vegetables, nut and even ice, into silky smoothies, juices, shakes, sauces. Adjustable speed settings allow you to have the drink in your own way. Fruit and vegetables are recognized healthy food full of vitamins and minerals that human body need digest. These healthy foods can be taken in as a cup of drink, but you can also have them as a dried food. This food dehydrator is a perfect snack chef in the kitchen. You can make preserved food by this programmable dehydration machine fast with fully retaining nutrition the food comes with. Digital controllable, the food dehydrator machine allows you to prepare for healthy fruit slices, vegetables, nuts, meats and other natural snakes effortlessly. In the afternoon, it couldn’t be better to enjoy coffee or tea with families or friends. It is a good way to strengthen the bonds of relationships and also a way to relax your body and relief bad mood. The programmable coffee maker machine is digital programmable with hands-free one-touch brewing function and 12 cup large capacity, allowing you to prepare for rich coffee drinks in advance and enjoy a happy afternoon with 7 to 10 people. Apart from beverages, cooking a nutritious meal for yourself and your family is quite the best choice. Electronic pressure cooker is not as dull as traditional pots. A programmable panel enables you to select one cooking mode as you like among up to 7 programs. It seems a piece of cake for the pressure cooker pot to stew, steam or keep warm. You can also prepare food by timer schedule to wake up or come back with a great meal. Now that you know may how to form a good living habit. Actually intelligent household appliances are only assistants to help you do that. The most important factor to have a good lifestyle lies in a healthy and optimistic attitudes and minds. In current modern world, keep the peace of mind and pursue the value of life.